1) Context: Practice building a “Pause” button for your emotions/reactions in order to take time to build context. 2) Imagine: Take the time, even in pressure-packed or with serious problems, to humour your imagination (even ridiculous ideas) as lateral thinking can help solve very tough problems. 3) Audacity: Once you’ve developed an understanding of the problem or situation you are facing, be “all-in” with your actions. 4) Listen to the field: People who are closest to the action have the best information on what’s actually going on, in any situation. We need to design ways to listen to these individuals, and empower them to make decisions. 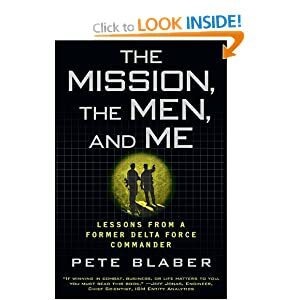 5) Mission, Men, Me: The title of the book is basically the last lesson, and an order of operations of sort of decision-making. First comes ‘Mission’ — focus on what you’re setting out to accomplish. Second is ‘Men’ — take care of your team, their health, their performance. Last, and only if the other two are secured, is ‘Me’ — focusing on your own interests. Parts of the book are an engaging read and illuminating about special forces and their sub-culture of excellence within the broader military culture.